"Dr. Melamed is an excellent neurosurgeon. You are in great hands with him." "Most caring doctor I have come across in my 80 years." "Dr. M did my surgery and I am great!" Itay Melamed, MD is a board-certified neurosurgeon who specializes in open cerebral vascular, endovascular, and skull base neurosurgery. He’s the founder of Advanced Brain & Spine, a physician-led practice that services Denver-area patients with two convenient locations in Centennial and Wheat Ridge, Colorado. After receiving his medical degree from University of Colorado Denver School of Medicine, Dr. Melamed went on to complete his residency training in neurosurgery at the University of Missouri in Columbia. During his residency, Dr. Melamed had additional elective training with orthopedic spine surgeons, an experience that allowed him to view the spine from many different perspectives. He also helped establish a vascular microsurgery workshop at his residency program and spent nine months receiving elective training with Dr. Troy Payner in Indiana. During this time, he learned techniques for managing skull base and vascular surgical cases. After his residency, Dr. Melamed completed a two-year endovascular surgical neuroradiology fellowship with the Indianapolis Neurosurgical Group, now known as Goodman Campbell Brain and Spine. During his fellowship training, he worked under two of the top interventional neuroradiologists in the United States. Following his fellowship, Dr. Melamed stayed with Goodman Campbell Brain and Spine. This gave him an amazing opportunity to work alongside some of the best vascular neurosurgeons, spine surgeons, and endovascular surgeons in the country. While in Indianapolis, Dr. Melamed also served as an assistant professor at Indiana University School of Medicine. Dr. Melamed devoted these additional years in elective and fellowship training to ensure he would have superior skills and knowledge to offer his patients. This is what gives him the expertise to manage most of his patients’ vascular issues through minimally invasive procedures. In fact, Dr. Melamed is one of only two private practice physicians in Denver who can perform both open surgical cases and minimally invasive endovascular cases. 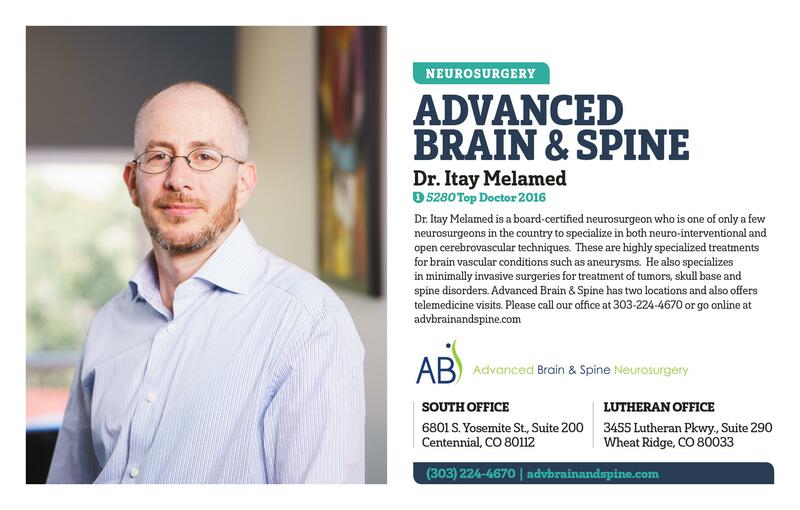 In May of 2011, Dr. Melamed returned to Colorado to be closer to his family and start Advanced Brain & Spine, which has quickly become the area’s leading neurosurgery practice. Dr. Melamed voted one of the best Neurosurgeons in Colorado. "The most honest doctor!!! Thankful to him tons. You can totally trust his opinion. He cares for patients." "Dr. Melamed is an excellent neurosurgeon surgeon. I know that I am in great hands with him, he has been wonderful." "Dr. Melamed takes his time and is extremely thorough and explains your procedure in details. His calm demeanor gives you the trust you need for a complicated surgery." "He listens to me and answers all my questions and spends the appropriate amount of time with me. He makes sure I understand all we talked about for my follow up..."